Early instar European pine sawfly (Neodiprion sertifer) larvae are now large enough to cause noticeable damage to their pine hosts which include Scotch, mugo, red, jack, Table mountain, and Swiss mountain pines. White and Austrian pines are occasional hosts. 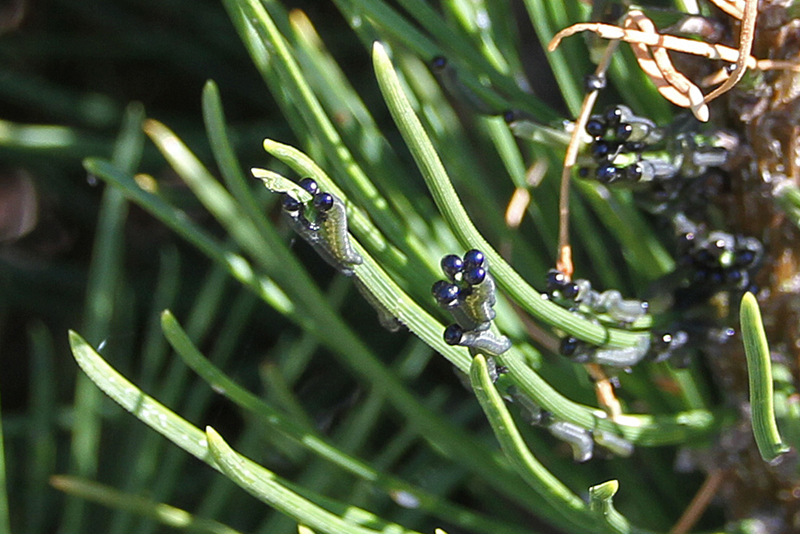 The larvae are grayish-green with bulbous shiny black head capsules; their color and small size make the difficult to see as they feed on the needles. All larval stages feed in colonies and practice the same feeding behavior. They start by aligning themselves with their head at the tip of a needle and feed downward to the needle fascicle. Groups of 3 - 5 first instar larvae may be found feeding on a single needle. Tiny first instar larvae are too small to devour entire needles. They only consume the outer needle tissue leaving behind the central vascular bundle which dries out and turns light brown. Clusters of curled, wiry, straw-colored "needles" are a telltale indicator that sawflies are afoot. European pine sawfly larvae complete their development at about the time new candle growth begins to emerge and elongate. There is only one generation per season. Their consumption of last season's needles means this sawfly has a limited impact on the overall health of infested trees. However, the loss of last season's needles affects aesthetics with this season's needles eventually appearing puff-like on the ends of denuded branches; the so-called "poodle effect." While most insecticides labeled for use on the conifer host will control the larvae, it's easy to dispatch the early instars by simply smashing the little buggers; gloves are optional. Colonies of later instars can be knocked to the ground and stomped; shoes are optional.